3. 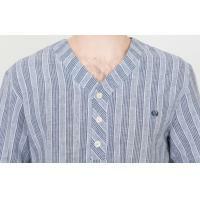 Short sleeve,V neck,button placket. 1. The fabric has been soft treatment,so the handfeel is very soft. 2. Three cream buttons in the placket. 3. One embroidery on the left chest. 4. Cotton chambray fabric on the back neck patch. 5. Neck band is self fabric,but bias cut. 7. Quality is good, delivery time is quick. The price of honest and credible. 8. Designs are stylish, trendy with many different sizes, giving customers more choices. The size chart is just for your reference. This garment is for Summer season.Our fabric is thin enough to make you cool and feel soft. All the dyeing material is environmental. Color fastness is very stable. If you choose our garment,you will have enjoyable time in home.